Super Savings Item! Save 31% on the UNISKY Foldable Wall Mount Bike Repair Stand,Bicycle Mechanic Maintenance Rack Workstand by UNISKY at Melon City Bike Club. MPN: TQXL-06-I. Hurry! Limited time offer. Offer valid only while supplies last. Why choose our Bike Repair stand? ★This brand new bike stand will be great for maintenance or just for holding the bikes whilst you clean them. Why choose our Bike Repair stand? ★This brand new bike stand will be great for maintenance or just for holding the bikes whilst you clean them. 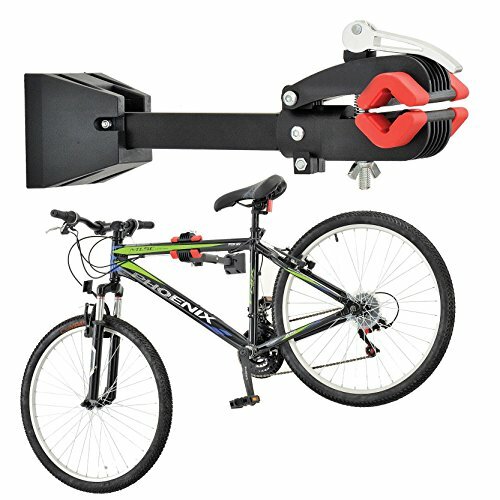 ★Wall Mount Heavy Duty Bike Bicycle Maintenance Repair Folding Clamp. ★The bike maintaince stand build with TPR Soft clamp jaws to prevent any scratch or damage to the bike. ★Fixed above the wall, can shrink, do not take up space. ★Perfect for repairing your bike when it is broken.Great accessory for bicycle workshop, club and cycling lover. High quality material:Made of steel and plastic,mounting flange has 5 holes,sturdy and stable to hold up to 66lbs (30kg),so it is sturdy enough to support your bike. 360° Rotating Clamp:clamp suitable for diamemter between 25-40mm,it allows your bike to be held in any position. Save space:You can install it to any post or wall stud.It locks in place against the wall and folds upwards away when not in use. No need to ask for help:The wall mounted bike clamp acts like a strong arm with a firm grip, holding your bike in a fixed position for as long as you need so you can give both hands to cleaning, calibrating and repairing your bike. Reduce Repair steps:You don't have to get it out of the garage, set it up, and then put it away.You just need to pull it down off the wall,pop your bike onto it. If you have any questions about this product by UNISKY, contact us by completing and submitting the form below. If you are looking for a specif part number, please include it with your message.